We contacted Budget's Sales Rep, Kyle, after having a very disappointing experience with another local propane supplier. He arrived at our home on time and explained everything very well answering all our questions. He made the necessary arrangements to install our tank and kept us informed. The installer, Colin, was great and had us all set up in a very short time even though it was a very cold day. The receptionist was very friendly and hearing we were new to the area gave me some "local" suggestions. This company offers VERY good customer service! Thank you again. In our minds you are a "customer service" star at Budget Propane! We really appreciate how quickly you have solved this problem for us. We have the best customer service reps! I just spent some time on the phone with Harold. He is just another reason for having Budget as my propane supplier. His knowledge and integrity are very much appreciated. Kim was great on the phone as well. Thank you for your reliable service. Living alone,I would be in an untenable position without conscientious suppliers such as you. I purchased a cottage last fall and have set up an account with you this fall. I have to say from the initial call, the service technician and your front office and delivery staff the experience has been fantastic. Everyone has been very patient with explanations and very accommodating for a panicky cottage owner! I would recommend your company to everyone. Glad I Went With Budget! Just a short fan letter to let you know how impressed we are with your team, and we aren't even customers yet! 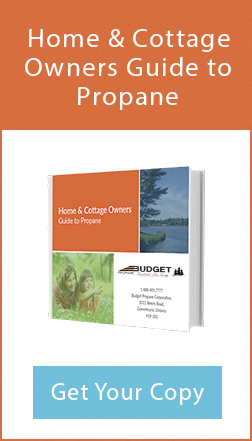 In the process of buying our cottage in Muskoka, we found the existing propane suppliers to be presumptive, difficult to reach, curt, even rude sometimes. Budget has been a breath of fresh air. At every contact point: website, telephone, email, you and your team have been both professional and friendly. Kyle was fabulous explaining the service, and Gerry came on site and took all the time we needed to agree and plan the switch to Budget. Fabulous team - looking forwards to years of happy service with you! I feel obligated to send you a quick email on my experience with Gerry Gabourie. Just to let you know from a brief conversation with yourself a few months ago I have signed up with Budget as of yesterday. Gerry was here late in the day and into the evening, (beginning of a long weekend) was one of the best salesman I have ever dealt with. Knowledgeable, up front and complete transparency. Coming from 9 years of sales my self it was very refreshing to deal with that type of person. I should mention he signed up my neighbour on the same night. He is a great representative of the Budget name. First of all I would like to thank you for your prompt and great service. Secondly, I have a suggestion. If you like, I am interested in putting a sign in front of my property to show that my heating system changed to Budget Propane as an advertising tool. Please advise.